In this review we’ll be looking at AMD’s other Ryzen Threadripper chip the 1920X. While the 1950X is a 16 core part the 1920X gives up one core on every CCX for a grand total of 12 cores in a 3+3 configuration. But it still offers the same memory, I/O, and platform support as the 1950X. In terms of clock speeds the 1920X shares an all core boost of 3.7 Ghz, four core boost to 4 Ghz, and four core XFR boost to 4.2 Ghz with the 1950X. But while the 1950X’s base clock speed is 3.4 Ghz the 1920X bumps it up to 3.5 Ghz on all of its 12 cores. The current pricing stack positions AMD’s Ryzen Threadripper 1920X up against Intel’s 8 core part the i7-7820X. Intel’s chip is a formidable competitor with the same two core boost clock speed of 4.5 Ghz as its 10 core i9-7900X brother. Consequently the pros and cons of this match up are very similar to the differences between the 1950X and the i9-7900X as the 1920X and the i7-7820X are basically just the same chips with fewer cores. AMD has priced the Ryzen Threadripper 1920X at $800 while Intel’s i9-7820X comes in at $640. Thus this chips aren’t quite in the same price bracket, but until Intel updates its lineup they are the closest thing to direct competitors we have. If you haven’t read our Ryzen Threadripper 1950X review start there for all the info on socket TR4 and X399 platform. Speaking of the 1950X that’s the first chip we will compare our Ryzen Threadripper 1920X to. Given that these two chips have the same all core turbo, four core turbo, and four core XFR clocks it should come as no surprise that they offer the same single threaded performance. 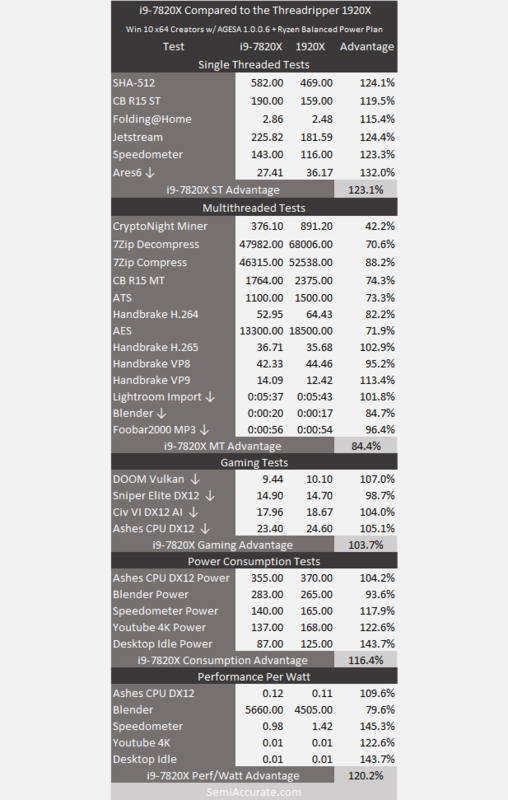 In fact gaming performance, raw power consumption, and performance per watt are all also nearly identical in our testing. Where we did record a significant gap was in our multithreaded testing where the 1950X managed to offer up to 27 percent more performance than our 1920X. Interestingly our Lightroom test seems to prefer the smaller core count that the 1920X has to offer. Hopefully Adobe will find the time to update their app to make better use of high-end CPUs. Now for the dollar for dollar battle royal. The i7-7820X quickly demonstrates the advantages that its massive 4.5 Ghz two core turbo state offers in our single threaded testing. 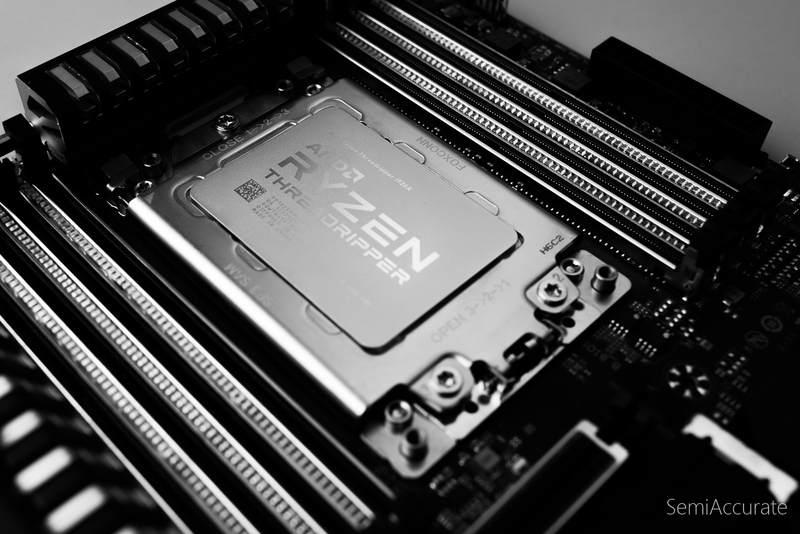 Equally AMD’s Threadripper demonstrates the power of its many cores in our multithreaded testing. These two chips offer parity in gaming performance while the i7-7820X goes on to draw a few less watts from the wall. Notably AMD’s Threadripper 1920X offers not only better performance per watt in our rendering test but it completes the test faster and draws less average power while doing so. While Intel’s $1000 Core i9-7900X is significantly more expensive that the Ryzen Threadripper 1920X it also offers a ten cores which is lot closer to the 1920X’s 12 cores than the i7-7820X’s mere 8 cores. What happens when we match these two chips up? As it turns out we can see that the 1920X is a pretty good value proposition when taking on the i9-7900X. In our multithreaded testing these two chips are on average at parity and in the really intensive benchmarks the 1920X is taking the lead more often than not. When the choice is between $800 and $1000 for the same multithreaded performance it seem clear what choice a consumer should make. Of course the i9-7900X still mains Intel’s lead in our single threaded testing and power efficiency in lightly threaded workloads. But if you’re going after a chip in this price bracket you’re probably not doing it because those concerns.